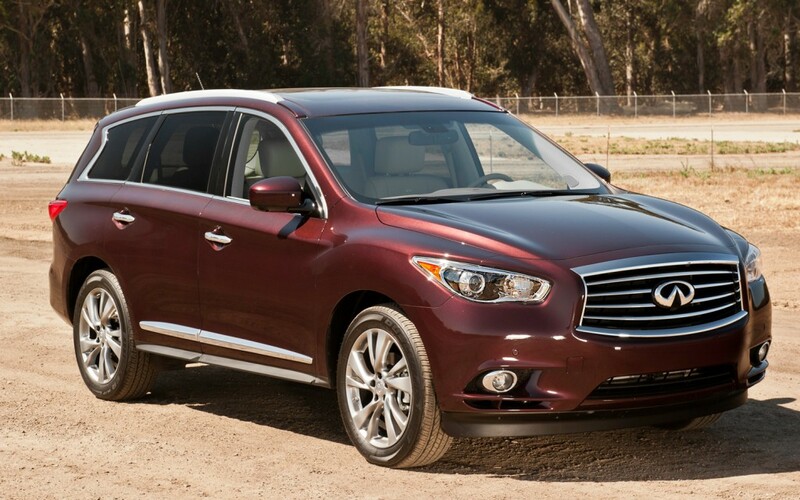 Infiniti’s goal with the 2013 JX three-row crossover is volume. That’s volume measured two ways, as in interior space and number of units sold. The thinking is that the former will facilitate the latter. This is America, after all. Wither the Infiniti of yore? While this type of product isn’t necessarily what you think of when you hear Infiniti, the brand’s leaders seem to be okay with that. Profit—not interesting and engaging vehicles—is what keeps the lights on, and in an attempt to reconcile the JX with its brand ethos of “Inspired Performance,” Infiniti says it has expanded the credo to include fuel economy and space. But it appears that only the amendment applies to the JX, while the traditional definition does not. The Acura MDX was the obvious—and stated—target. Lexus’s RX, although it has only two rows of seating, should also be on the list of competitors; Toyota’s luxury arm moves so many of them it’s sort of hard to ignore. The G sedan/coupe/convertible is the brand’s bestselling line; Infiniti expects the JX to join the G at the top. This new Infiniti is based on Nissan’s front-drive D platform (Altima, Maxima, Quest, others); Nissan will get its own version of this three-row crossover soon with the reemergence of a car-based Pathfinder. (Major differences will include chassis tuning and reduced noise insulation for the Nissan.) The JX35’s carlike underpinnings contribute to, er, Inspired packaging Performance: Although shorter and narrower, it offers about as much passenger space as and more legroom in each of its three rows than Infiniti’s larger QX56. The JX’s more-feminine look compared to the Big Daddy QX was no accident; Infiniti expects the JX to be its most popular model among lady types. If you can get comfortable driving a Murano, you’ll have no problem doing the same in a JX. Our only real ergonomic quibble is a tilt/telescope steering column whose pivot point is too close to the steering wheel, which means up/down movement really just sets the helm at odd angles. Rows two and three are where the JX shines, however. The middle bench can slide fore and aft 5.5 inches, and entry to the third is easy from either side; the seat tacos onto itself (think Kermit’s hospital bed in The Muppets Take Manhattan) and slides forward to open a big gap to the way back. With a child seat in place, the seat still will slide forward enough to let small people slip into the third row. Space for the rearmost five passengers is minivan-like. The powertrain is the same as the Murano’s: a 265-hp, 3.5-liter V-6 hooked to a continuously variable transmission and either front- or all-wheel drive. The unremarkable output is proof that the JX doesn’t take a “more is more” philosophy across the board, and the transmission has the dubious honor of being Infiniti’s first CVT. It is “sport-tuned” (we never received a good definition of what this means) and will do an impersonation of a six-speed automatic. This mimicry is accomplished with a lack of success similar to a tofu dog subbing in for a bratwurst. The shift lever has a manual gate for on-demand ratio selection, and the Drive Mode Selector’s Sport setting will cause it to click off shifts from one faux gear to the next. Well, it more slurs than clicks, as it basically interrupts power momentarily before picking up where it left off. That said, this is easily the best CVT on the market, and it’s better than a few actual automatics. Thankfully, undesirable droning from Nissan’s corporate V-6 has been largely quelled. EPA fuel economy is 18 mpg city/24 highway for front-drive models and 18/23 for all-wheel-drivers; we saw 16 mpg in mixed driving. Although most JX buyers won’t be too concerned with test numbers, we offer results from our shakedown of a fully loaded JX35: Zero to 60 mph took 7.8 seconds, and the quarter-mile passed in 16.0 at 90 mph. At 4552 pounds, the test vehicle was 369 pounds heavier and nearly a second slower to 60 mph than an all-wheel-drive Murano with the same engine and a CVT. Grip (0.76 g) and 70-to-0-mph braking (181 ft) were identical or very close to that Murano’s figures. So it’s not exactly a driver’s car, but few crossovers are. One exception, ironically, is the Acura MDX. Its sophisticated Super Handling All-Wheel-Drive system not only provides additional all-weather traction but also aids handling with side-to-side rear-wheel torque vectoring, and the Acura’s steering provides good feel and accuracy. The Infiniti’s all-wheel-drive setup, on the other hand, offers no torque vectoring, and although its steering has some weight when pointed straight ahead, the heft disappears once a few degrees of lock are dialed in. There is virtually no feedback from the helm in any situation. The stereotypical crossover buyer may find this preferable. Or they may not notice at all. Concerning a lack of driver involvement, the JX is arguably the closest we’ve yet come to a mass-produced driverless car. To Infiniti’s constantly growing list of three-letter initialisms, the JX adds BCI: Backup Collision Intervention. Using radar in the rear quarters and the sonar parking sensors in the rear bumper, the car scans for cross traffic and obstacles and can stop itself from reversing speeds of up to 5 mph. Infiniti says the system is intended for mall cross traffic; we confirmed its compatibility with a Whole Foods parking lot. Adding this to LDP (Lane Departure Prevention), BSI (Blind Spot Intervention), and IBA (Intelligent Brake Assist), the car can control its position anywhere on the X or Y axis: There is no straying from the lane, rear-ending the car in front, or backing over the neighbor kid. On the bright side, they’ve almost run out of ways to stop us from doing things. Many of the non-reverse active nanny features can be turned off with the press of a single button on the steering wheel, which is a nice change from previous Infinitis’ indecipherable button salad. Their accompanying warning functions, which get their own set of initialisms, stay active, however, but can be deactivated through a menu displayed on a color screen in the IP. Infiniti also has improved the functionality of the Around View Monitor camera system—a piece of tech we like—to show the direction of the front wheels in the overhead view and also provide person and object detection with attendant color warnings. Infiniti’s high-volume philosophy carries over to the included equipment. Standard features on a $41,400 front-drive model include leather seating, a power liftgate, a moonroof, keyless entry and start, automatic bixenon headlights, and 18-inch wheels. Adding the $4950 Premium package brings navigation, maple wood trim, the Around View Monitor, and Infiniti Connection telematics; the latter provides Google Calendar integration, remote unlock, zone and speed alerts (perfect for when you let the kids take the car), collision notification, and more. A Theater package adds a pair of 7.0-inch screens in the front headrests, a 120-volt power outlet, and two sets of wireless headphones for $1700. The Driver Assistance package ($2200) includes Intelligent Brake Assist, blind-spot warning, Backup Collision Intervention, Distance Control Assist, and radar cruise control, as well as a heated steering wheel, remote start (another first for Infiniti), and the Eco pedal, which pushes back on your foot to impede progress in the name of efficiency. (This last annoyance can be completely avoided simply by never setting the Drive Mode Selector to Eco.) The Deluxe Touring package, which can’t be optioned with the standalone Driver Assistance group, upgrades from a 13-speaker Bose sound system to a 15-speaker version with 5.1 surround sound, and also gives you 20-inch wheels, a rear roof glass panel, a ventilation function for the front seats, heated outboard second-row chairs, a cabin-air filtration system, and rain-sensing wipers, all for $2550. The Deluxe Touring package is required when ordering the $3100 Technology package, which brings all of the kit from the Driver Assistance group and adds lane-departure warning with lane-departure prevention, blind-spot warning and intervention, and a pre-crash function for the front seat belts. All Infinitis include a free year of Infiniti Personal Assistant, which is basically a concierge service for your life—kind of like a human version of the iPhone 4S’s Siri. Our loaded test car had it all, including the $1100 all-wheel-drive option, for a total sticker price of $54,800. Infiniti is quick to point out that this is a few hundred bucks shy of a loaded MDX. Competitive pricing likely will be the JX’s most important weapon in its value-conscious market segment, and this volume play is a good move for Infiniti; it’s simply one whose merits will be measured on a balance sheet rather than a skidpad. As long as none of your must-haves involve Infiniti’s old definition of performance, the JX can be considered a success.